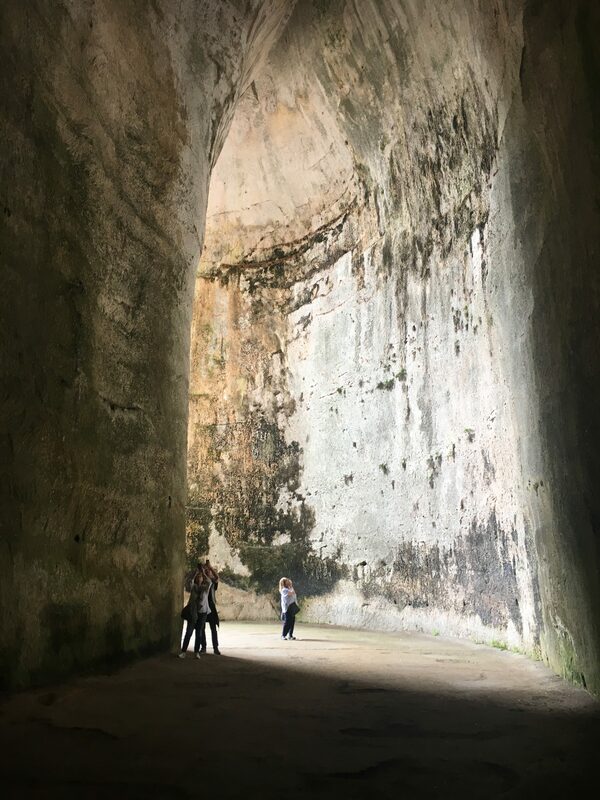 The “Ear of Dionysius”, a cave characterized by its unique shape and acoustics, is believed to have been originally designed to hold rainwater and is part of an ancient limestone quarry. It was named by Italian painter Caravaggio after the Greek tyrant Dionysius who ruled Syracuse around 400 BC. According to a medieval myth, Dionysius used the cave as a prison and spied on his prisoners out of the hole at the top–hence the “ear” of Dionysius. Another myth has it that during the Sicilian Expedition, Athenian prisoners were taken and put in these quarries and were able to be freed because as they worked they sang songs from Erupides’ plays, and the Syracusans were so charmed that they released them.